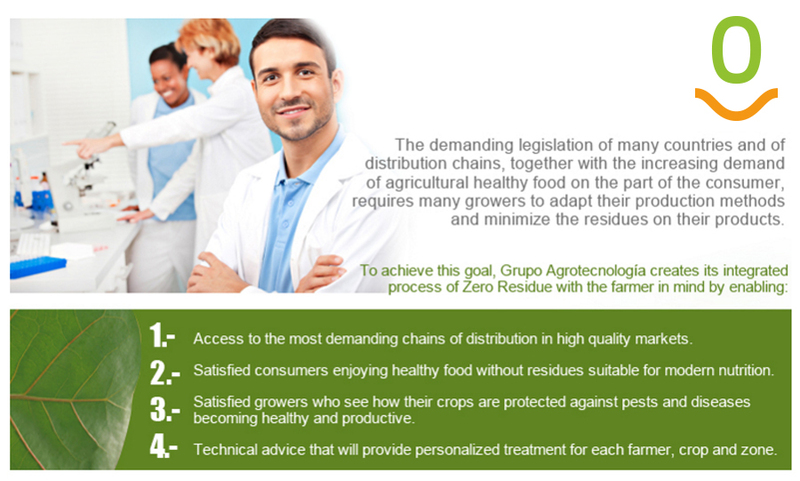 Grupo Agrotecnología provides its clients with treatments programs by crop to achieve zero residue. They present the products to use during the cycle and the way to use them to obtain healthy crops, with high yields at the best cost and always guaranteeing zero residue. Grupo Agrotecnología is a member of various associations of organic agriculture and vegetal nutrition. They bring together several technology-based companies to get training on enhancing profitability and gathering information about Spanish and European legislation concerning agriculture and protection of the environment. The broad range of products from Técnicas de Control Biológico (TCB) is recognized worldwide by the main control and certification agencies and in compliance with organic agriculture regulations. These products, free of chemicals and GMOs, are certified to be commercialized and exported to Europe, Japan (JAS), the United States and South America (NOP).